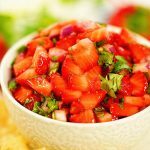 Strawberry Salsa is so tasty! It's perfect for a bbq or cookout because there's no need to refrigerate it. In fact it's better at room temperature! Serve it with chips or top off your favorite grilled chicken, pork or fish. Clean the strawberries, remove the stems and dice. Dice the onion and mince the cilantro and jalapeños (you can use fresh or canned peppers) and add all of the ingredients to a large bowl. Add the remaining ingredients and stir well to combine. Serve with chips as a dip or on top of grilled chicken, pork or fish - delicious!